If you missed them, you can catch up on the different parts or keep reading and get the complete rundown below. One of the best resources available to you is the What's New section on the SOLIDWORKS website. Here you can find all of the new features that will be available in the 2019 update and the Design to Manufacture Solution. We put the full list of features at the bottom of this post so you can jump straight to the ones you're interested in. More of a visual learner? SOLIDWORKS has something new for you, too! They added twenty-five new videos to their YouTube channel showing off all the new features and capabilities the software upgrade is bringing. Curious about the telescope you see associated with the SOLIDWORKS 2019 release? 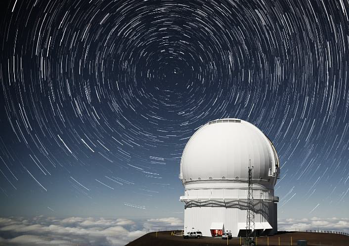 It was designed by the Canada-France-Hawaii Telescope Corporation with the help of SOLIDWORKS software. Discover the advantages it brought along in the full case study. You can also hear from Greg Green who is the instrument designer and machinist at the telescope and get his thoughts on the new release and his first hand experiences. To make sure you're ready for the big upgrade we prepared you a quick guide. This is a step-by-step manual to take you through everything you need to consider! Tab and Slot Feature Enhancements for Fabricated Products- The Tab and Slot feature now handles a lot more design scenarios. More flexibility means more productivity, helping you get from design to manufactured product faster. What's New in SOLIDWORKS Visualize 2019- Set up your projects and get them looking photo-quality even faster using Al Denoiser, real-world physics, advanced measured materials and new video decals, all combined with custom keyboard shortcuts. New Design Capabilities- New manufacturing technology creates new design opportunities. Innovative Collaboration Tools Speed Design- SOLIDWORKS 2019 provides many new and innovative tools to help you collaborate faster and easier. Innovative New Ways to Design with the Latest Technology- Design hardware has changed a lot in recent years. To be productive and get the most out of these new devices, SOLIDWORKS has evolved alongside the hardware to support you every step of the way. Enhanced Configurations Support, Ease of Use and Performance- eDrawings enhancements include data access with WebGL technology, BOM Cutlist configuration and Right Mouse Button updates. NEW Extended Reality (XR) Exporter from SOLIDWORKS CAD- Publish your SOLIDWORKS projects to power immersive Augmented Reality, Virtual Reality and Web experiences. Accelerate Product Development with eDrawings 2019- eDrawings 2019 enables easy collaboration throughout the supply chain with enhanced file support and install-free design sharing. More Power for the SOLIDWORKS Design to Manufacture Solution- SOLIDWORKS 2019 delivers more power for the SOLIDWORKS Design to Manufacture Solution suite of tools including improvements to SOLIDWORKS MBD, SOLIDWORKS CAM and SOLIDWORKS Inspection. Communicate Your Critical Design Information via the Model- SOLIDWORKS MBD 2019 adds support for Sheet Metal annotations, gives you greater protection over your intellectual property and the ability to copy dimension schemes to derived parts. Create Inspection Reports with Greater Flexibility- Group and ungroup characteristics with ease. Automatically extract characteristics' zone location the information contained in hole tables, including quantity, X and Y positions and callouts. SOLIDWORKS 2019 Treehouse Enhancements- SOLIDWORKS Treehouse, the standalone application for building, viewing and managing SOLIDWORKS assembly structures outside SOLIDWORKS, has been improved with some exciting new capabilities. New Design Capabilities with Mesh and Scanned Data- SOLIDWORKS 2019 introduces new tools like Slicing and 3D texture, while updated enhancements to Projected Curve and Partial Chamfer all work to streamline your part modeling workflows. User Interface Enhancements in SOLIDWORKS 2019- SOLIDWORKS 2019 simplifies complex processes and brings commonly used commands to your fingertips. Productivity Enhancements for Milling- Defining rules for each CNC machine creates standards for specific manufacturing workflows. Automatic feedrate changes for arcs and sharp corners provide flexibility in the programming process. Drawing Enhancements in SOLIDWORKS 2019- SOLIDWORKS 2019 contains many enhancements that will make your design detailing faster and easier. 3D Markup: a Great New Way to Collaborate- Add markups and notes directly to your 3D model using the new 3D Markup capability. Just orient your model and begin. 3D markups are saved with the file and can also be exported in various formats. Innovative New Ways to Design with the Latest Touch Hardware- Design hardware has changed a lot in recent years. To be productive and get the most out of these new devices, SOLIDWORKS has evolved alongside the hardware, supporting you every step of the way. Streamlined Assembly Workflows- Working with assemblies in SOLIDWORKS is now easier and faster than ever before with a range of enhancements to make common workflows faster. Enhance Your Programming Automation and Use of MBD Data- Apply tolerance specific machining strategies for turned components. Simplify Large and Complex Assembly Models Faster- The Silhouette Defeature option is a new enhancements that has been added in SOLIDWORKS 2019 to significantly speed up the process of simplifying assemblies. Improved Large Assembly Performance- Many new enhancements have been included in SOLIDWORKS 2019 to help improve large and complex assembly performance. More Flexibility When Created Exploding Views of Assemblies- It just got faster and easier to explain how your assembly goes together with SOLIDWORKS 2019. Topology Study: Ideal Geometry for Your Design Requirements- Use weight, strength, factor of safety and frequency constraints to drive optimized topology in your design. Graphics Gets a Performance Boost in SOLIDWORKS 2019- SOLIDWORKS 2019 delivers significant graphic performance enhancements for large assemblies giving users optimized view manipulations for a better overall experience. Want more? SOLIDWORKS has a complete list of all the new features, plus a list of overall performance improvements. Too many details? Starting in October we will be releasing a series of SOLIDWORKS 2019 videos based on our own Engineering Teams' personal experiences and practical summaries of all these fantastic updates. The only way to get them is to sign up and this is definitely something you don't want to miss!